I've been on a productivity kick, and it's not going very well. I'm an avid reader, and I'm forever reading about the best productivity tricks, how to be organized and why waking up early is the key to success. I set my two alarms and still hit snooze. The result? I feel guilty the entire day and feel rushed to complete everything that I need to. I’m a huge fan of Damon Zahariades and have read his books Fast Focus and To-Do List Formula. Also, I love reading his blog every chance that I get. What I enjoy about Damon's writing is his conversational style. His books are engaging, and it's like sitting down with a close friend to hear his advice. Real friends give it to us straight and know where we might get hung up in life. Damon not only educates us in an amusing and engaging manner, but jumps in to catch us when we fall to get us on track with ingenious tips and advice. 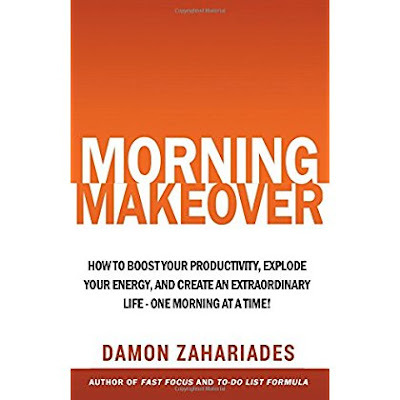 Damon’s latest book Morning Makeover is one of those books that you may consume in one reading. His writing flows from chapter to chapter, and every page will speak to you and perhaps even convince you to change your morning routine even though it may be a little painful at first. One of my key motivations for getting up earlier is to exercise and meditate. I find the day gets away from me if I don’t jump on this first thing. Damon is quick to point out that "getting up early is 90% attitude and 10% showing up". You are in control, and any changes start with you. Damon shares his personal experiences and challenges which remind us that we are human and hate change. He offers ten reasons that a morning routine impacts your life but warns us not to go nuts and make too many changes at once. A few of these include giving your day structure, having more energy, and just feeling better throughout the day. Exactly what I need. You need a “why” to start a new routine. Damon spends valuable time explaining how intentions can be powerful because they entice you to act with purpose. Intentions push us and “exhilarate” us to take action. Moreover, it is your intentions that are a platform from which you will begin to build a new morning routine. I suggest listing 3 of your key intentions to give you some guidance on where to start and to justify to your "why." Morning Makeover is divided into four parts, and each one builds upon the others. Damon eases us into accepting change and building ourselves up for morning success. Like a friend, he also spells out the challenges and roadblocks that we will probably face. Ready to start making your routine? Part I is the basis for success throughout your day. Sleep. Research has been coming out daily about how critical sleep is and how our bodies and minds shut down without sound sleep. Damon shares some quick and dirty sleep information and tips to have a restful sleep. If you aren’t rested, you won’t easily pop up and your morning routine is out the window. You will be back to ground zero. Rising early will enable you to be more creative, have increased productivity, and you will be less likely to procrastinate. Part II shares a ten step plan to create your personal morning routine. No one can do this for you, and you need some skin in the game. These actions complement your intentions; the one’s you set above, which in turn form your morning routine. Some of these include identifying your "why," determine how much time you need each morning to get ready, and choosing activities that will maximize your energy throughout the day. Part III is where Damon motivates to keep going when we are ready to throw our hands up. Damon reminds us that there will be challenges and shares some common issues we all face when trying something new. Like a good friend, he gently reminds us that we all fall and need to start again. Part IV is very fascinating. Damon shares the routines of ten very successful people. They aren't all that different than you or I, however; they have an intention and stay within a routine every day. We learn the habits of Tony Robbins, Gary Vaynerchuk, Howard Schultz, and Cheryl Bachelder to name a few. Some of the frequent early morning acts that they share include exercise, meditation or deep breathing, reading, playing with pets, journaling, and music. I bet most of these sound familiar to you. It's all a matter of what habits align with your intentions and carrying them out to fruition. If you feel unorganized, restless, and tend to procrastinate, perhaps now is the time to pick up Morning Makeover and discover your intentions so that you can start a new morning routine. It will give you a daily personal purpose, and you will be amazed at how much better you feel, you will be more connected to your work throughout the day, and it may be the change that you have been searching for to become better connected to your life. This book won't disappoint. Storytelling is an art and has been the engine behind knowledge being passed down for thousands of years. Stories exist to entertain, educate, impress, and engage. A gratifying story is like a great joke, but not everyone can tell a funny joke or graciously bring a story alive so that we find meaning or grasp new lessons. If you love an engaging story, then pick up a copy of Farmer Able by Art Barter. 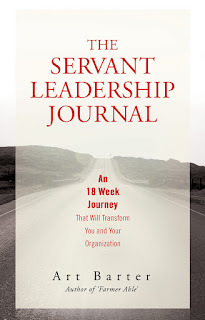 This book will engulf you and take you on a journey to discover the heart of servant leadership show why the world is not all about you. A trust breakdown causes a rust buildup; everything moves slower and costs more. Caring for others: weakness or strength? Sometimes a self-made man can become self-absorbed. The attitude and behaviors you lead with will follow. Truly caring allows you to carry 50 times your weight. Farmer Able’s animals come alive. We hear them chattering with each other, bickering about Farmer Able, and acting snarky with the animals that they loath. The story begins with lazy pigs and Farmer Able's grumbling that the pigs are running the farm. Starting with Clarice the cow thinking "it's all about Able” the other animals pick up on this and begin to get jealous and are resentful about working hard or producing milk, eggs, or caring out their purpose. Soon we see nothing but problems. Farmer Able is obsessed about profits and production. When he doesn't see results, he starts trying to push for results. He rations food to save money, he locks up the chickens in the dark to increase egg production, and he angers the cows and horses. No one wants to work because they don't feel valued or appreciated. Farmer Able adopts an authoritative mindset and frets about everything. His relationships suffer all over the farm. The animals don't trust him; his assistants don’t understand him, and his relationship with his family goes south. The farm is upside down. One night, Farmer Able begins receiving insights from the oddest place, the wind. We start to see Farmer Able hear valuable whispered phrases throughout chapters that reach down and bring change up from inside. The first words are "It's not about you." Our farmer's life and actions change as he hears "believe what you believe," "Trust is a must," and "ours is yours." Farmer Able transforms before our eyes. He shocks the animals by showing more care by cleaning their area, giving them freedom, and interacting with them. They slowly trust him again. Able no longer frets over profits and begins to do the right thing for others. He makes wise management changes with his people and chooses a farm leader with empathy who puts others first. Most importantly, Farmer Able places his family first and heals his relationships. Farmer Able teaches us critical lessons without us initially realizing it. I found myself on the farm engaging with the characters gripped with intent interest. As the chapters grew with new messages, I found myself rich with new ideas. The pigs were never actually running the farm and causing chaos. Farmer Able's mindset and authoritative behaviors were the culprits. His thoughts justified his actions, and the farm suffered from every renewed push. Able's focus on production was dysfunctional and impacting progress. Sound familiar? Our farmer's mindset is like so many leaders today that runs organizations. Authoritative leaders think that pushing and demanding more brings results. Sadly, these actions have adverse effects. By the end of the story, Farmer Able's enlightened servant leadership style is what brings change. The whispers of the wind teased him into looking deep inside him and bring internal change that changed those around him and ultimately saves the farm. Our journey ends with learning the same valuable lessons that our farmer does. Be a servant leader and put others first. Lead from the inside out for impact. Change inside of you will have a dramatic effect on those around you. I loved Farmer Able by Art Barter, and it's one of my new favorites. This book is a key resource to use with your teams or those that welcome lessons to bring out the best in others. It’s a heartfelt story about leading with purpose while creating change with an ethical approach that engages, empowers, and ultimately serves others, not you. I am just digging into Art's journal, and I feel so challenged. I look forward to new learnings and growth that I can apply to how I interact and empower others. More to come after my 18-week journey! I am fascinated by the variety of cultures in organizations, and an active culture has always been my priority in looking for a new opportunity. I've learned the hard way what doesn't work and have been blessed as well by working with professionals that support one another and form a community. I've searched for the degree of relationships, community, empowerment, leadership, innovation, resilience. The list goes on and on. Guess what quality I haven’t searched for yet? Compassion. It never occurred to me to look deep inside an organization for compassion nor have I expected it. 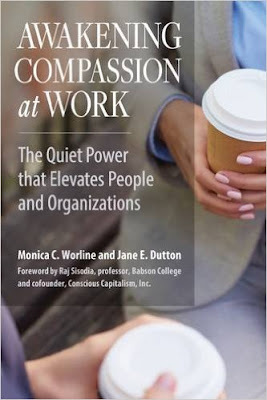 After reading the new book Awakening Compassion at Work: The Quiet Power that Elevates People and Organizations by Monica C. Worline and Jane E. Dutton, I have placed compassion at the top of my list when I look for exemplary cultures within our organizations. When I was a newly minted manager, I had the same thought that so many others hold today, strong leaders just drop from the sky and hit the ground running. It didn't take long for me to learn that a leadership title means little and some of the worst leaders have titles. My exposure to different leadership styles was beneficial, and often the most effective leaders were quiet and purposeful. Leadership is a journey, and we all have the abilities within us, but most of us need guidance, development, and mentoring. 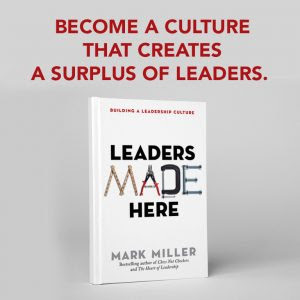 Mark Miller’s new book Leaders Made Here is an entertaining and purpose driven book that shows us how leaders grow internally. Companies should develop leaders for future change and growth and guess what? Every company needs a surplus of highly developed leaders ready to jump into spots throughout an organization. Companies should create an active culture where leaders are developed and championed on an ongoing basis with the end goal of having a surplus of leaders. Mark leads us on a journey illustrating how to nurture leaders at all levels starting with the front lines and moving up the ranks. Moreover, Mark gives us a “game plan” for how we can grow our own leaders and the tools to employ for success. What I enjoyed most about Leaders Made Here is how Mark shares his ideas to assist in developing others. Mark doesn’t just throw ideas, tools, and examples at us. Mark visually leads us down the leadership process by telling us a story. Who doesn't love a great story where we can join the characters in learning? Mark shares the story of Blake, a new CEO at a company that recently experienced some serious setbacks including a plant explosion. Blake quickly realizes that he needs guidance from outside the company to help him bring stability, change the culture, and grow leaders to fill gaps in the organization. Charles is an old colleague that Blake brings to join him on his journey to locate some best practice ideas from some key successful organizations around the world. Each company that they visit has a unique view on building leaders, offers questions for the team to ponder, and ideas to help them to form their practical plan to grow a leadership culture and cultivate future leaders. How do you know when you have achieved a leadership culture? Simple. You have success when leaders are developed, and you have a surplus of energized and capable leaders waiting in the wings. Mark Miller reminds us that there may be some resistance to building a leadership culture from within and before we can develop we need to set excuses aside. Do these flimsy reasons sound familiar to you? Does the last point hit home to you? Leaders Made Here was written to help those of us who just don't know how to create a strong leadership culture. To learn how to build one we follow the visits of Blake's team to benchmark companies to glean ideas. Each organization they visit is unique in their industry, vary in size, and have gone about culturing leaders in a different way. At the end of each visit, Blake and Charles are asked some fundamental questions to mull over with their teams. Here is a snippet of some of the ideas from the teams that they met. The partnering and enthusiasm of Blake’s team as they walk down the path of learning from others and bringing back best practices to the company is enjoyable for the reader to be a part. You will feel like you are on the team as they bounce ideas off of one another and formulate the end product of making leaders. The reader has a seat at the table in learning what Blake and Charlie’s team wrestles with and the thought processes that take place to bring them to the point where they share their vision of building leaders to the rest of the organization. It's a journey worth joining, and the process and ideas will be burned into your mind as if you were indeed there. If you have a hand in growing a leadership culture jumping into the journey with Blake’s team is a necessity. 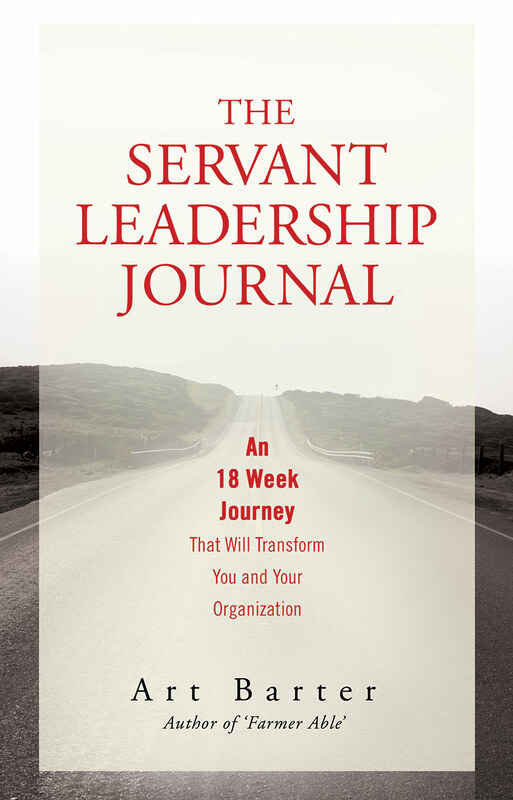 You will enjoy the leadership building story without even realizing how many ideas and knowledge that you are soaking up. Growing leaders is an intentional process, and every leader at any level should have a sound road map to guide them so that development bubbles both ways within a business. What will you do next to develop your leaders? As I examined my childhood past the last decade, I learned a lot about myself and those that were a part of my life. When I was in my 20's, I never thought much about how childhood shapes a person or how some people overcome their past to achieve or why so many remain stuck. The ability to examine my past has given me the tools and skills to grow as an adult and comfort in understanding how I think and react. 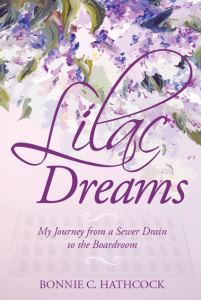 I was delighted to read the new book Lilac Dreams – My Journey from a Sewer Drain to the Boardroom by Bonnie C. Hathcock. Bonnie's book is a journey through her adolescence and how she was shaped to become the leader that she is today. Bonnie C. Hathcock has 35 years of experience in corporate America. For most of those years, she held corporate leadership positions at the top of Fortune 100 and 200 corporations. Bonnie began her career at Xerox Corporation and was often the only woman in the boardroom. Bonnie recently retired and decided to come forward to share her simple but difficult childhood to help others find joy. Bonnie’s book is not a complete journey from her childhood streets to corporate America sharing all of her successes and tribulations. Her story leads us from childhood through her college years and ends with some of her personal reflections. Initially, I was disappointed that her story did not continue to map her path to corporate success like other leadership journey books. Upon reflection, I understood why Bonnie chose the story that she shares and why she focused on certain timeframes. She wants the reader to understand her childhood with all of its pain, challenges, and disappointments. You see, these experiences shaped her and offered her stronger determination and most importantly, blessed her with an infallible work ethic. Life dealt her a weak deck of cards, but she was able to use her unique skills and strengths to become successful and impact others. I was amazed at the details in Bonnie's journey at each stage of her life. Each detail that she shares including sights, smells, feelings, and sounds are a part of her and impacted her in some way. The details she introduces to us assist the reader in being a part of her vision. For instance, her neighbor Miss Nancy had a beautiful purple fragrant Lilac tree in her lush garden that provided Bonnie a sanctuary in which to dream. Her description of the tree and lush surroundings inject us right into the scene with her, and I could even smell lilac as I read. The tree becomes symbolic of the hopes and dreams that a young Bonnie shares with us. While you may think that the life events the author shares are just that, they are more. Not only did they add to her shame in growing up poor and humble, but they impacted her character and laid the foundation for her success as an adult. Bonnie wants us all to reflect on those who have blessed us by being in our lives because they were instrumental in shaping us. Her parting advice to all of us is to face that which scares us, humbles us, or has limited our growth. She wrote Lilac Dreams to ultimately share her hope that we all find joy in our lives. To do so we may need to reflect on our past or face memories that we have locked away. At the end of sharing her childhood struggles, Bonnie offers a sound lesson from her life experiences, "The one lesson I have learned above all; Joy is within each one of us. We just have to choose it". Some may initially think that her story is just that, a story. However, Bonnie leads us down a path of discovery. It is up to us whether we choose to grow and be happy or if we are to remain stagnate and unhappy. Perhaps this book will help you remember some of your childhood Lilac Dreams? One of my joys and strengths as a manager is motivating my team. I always try to have fun and engage everyone to bring out their gifts for success. In particular, I have a knack for coming up with zany sales contests that encourage everyone to participate and achieve. Rarely has energizing everyone and being an enthusiastic coach failed me. When I saw the book Why Motivating People Doesn't work and What Does - The New Science of Leading, Energizing, and Engaging by Susan Fowler I had to read it. According to Susan, all of my contests, prizes, encouragement are key failures in motivating people. Huh? My insular management world came crashing down. One of the key drivers that Susan introduces is that we don’t need to motivate our people. They are already motivated; we just need to discover what motivates each individual. Managers simply don’t know or don’t ask what motivates their people so there is a clear disconnect. Managers seem to think that people are motivated primarily by external factors such as money, cash prizes, trinkets, and promotions. If you can provide those things you are a great manager. It’s not that easy! Employees prefer more internal motivators that they can control such as challenging and interesting work, growth opportunities, or learning experiences. See the problem? As managers, we tend to view what we think drives our employees and sometimes employees don’t even know what drives them because no one has asked. Certainly, some employees may never be happy. Motivation is a two-way street and a skill that some people refuse to embrace learning what motivates them and how to create motivation in their lives. Susan introduces us to several models and tools in Why Motivating People Doesn’t Work. One of the key elements is the Spectrum of Motivation model. There are 6 motivational outlooks and you will quickly notice that 3 are an optimal state, which we call health food, and 3 are a suboptimal state, called junk food. This spectrum helps us to understand people and their outlooks on factors such as well-being, productivity, long-term performance. We want to steer people towards optimal factors for continuous motivation and success. 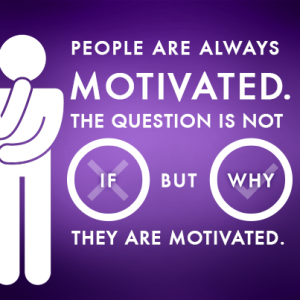 In order to motivate people you also need to understand the 3 psychological needs for motivation that people have. They are quite simple and you probably look for them every day in your own work. They include autonomy, relatedness, and competence. Without the presence of these factors, your people will never experience optimal motivation. Moreover, in order to protect ourselves from distractions and for sustained motivation we all need to look inward. If leaders don’t do this themselves they will have an impossible job of bringing it out in their people. Internally we all need mindfulness so that we are aware of the here and now and can react without judgment. Often we catch a glimpse of this when we meditate and then use the skill every day. Second, we need to determine and live our own values. These are the standards that differentiate people. Last, we all need to know our purpose. This is a tough one for a lot of folks. We should all discover our meaningful reason for living our lives and live by our values. Susan takes us on the motivation journey by sharing the skills that leaders need in order to “activate” the motivation within our people to reach the optimal state of motivation. Once we’ve made progress in this area we need to master the conversations that we have with people to impact their outlook. These conversations should take place when we need to motivate poor performance but also need to take place with our high achievers or those that have questions to maintain their motivation. To do this, leaders need to be prepared, trust the processes that Susan shares, and step back to reflect. Along with the growth in motivation, we have challenges. Why Motivating People Doesn’t Work shares 5 beliefs that really damage workplace motivation. They are those that we run into daily and we all cringe because they leave out the human element. The only thing that really matters is results. If you can’t measure it, it doesn’t matter. Why Motivating People Doesn’t Work is like a story as we move through what motivates people and how to be successful in guiding them. Susan shares numerous tools and real life stories to drive her point across and to help us grow as leaders. The last chapter in the book has some helpful frequently asked questions in case you want additional clarification. Moreover, it’s refreshing to read how other leaders have struggled or accomplished the nuances of motivation. This book kept me glued to the pages to learn what I was doing wrong in my motivational efforts. While I thought my contests, fun antics, and focus on results was the reason for our success, it wasn’t. Without realizing it I was doing the right things because I talked with my people individually to find their strengths and play to them. I learned what motivated them and how to bring out their best. Their optimal motivation remained elevated because I played to their internal needs without even realizing it. Are you ready to face the traditional methods of motivation and turn them upside down?